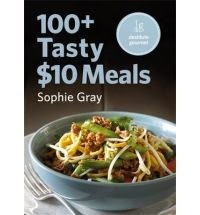 I've had the joy of reviewing Sophie Gray's latest Destitute Gourmet endeavour, 100+ Tasty $10 Meals, and think it will be welcome in the home of anyone trying to shave money off their grocery bill. The entire book is dedicated to meals that cost $10 or less to prepare. I spent two weeks trying out a selection of recipes from 100+ Tasty $10 Meals and found several I'll be adding to my regular menu plan. Easy to make, tasty and frugal beyond belief! What could be better? A chapter dedicated to money saving principles has excellent tips for stretching your grocery dollars further. Sophie's three basic principles are to shop smart, eat healthily and in season, and make a little of something luxurious go a long way - and she's given great ideas for putting those tips into practice. Sophie has done the hard work, figuring out how much individual ingredients cost and putting them together to best effect so we can just glide on in and make tasty meals without worrying about breaking the bank. Recipes are well thought out and easy to follow - you can read my thoughts on the recipes I tried here and here. Many of the recipes have accompanying cook's tips which give variations you could make to recipes to change them up a bit. I love the Stir-fries and Noodles section. The flavours. Oh the flavours! We enjoy a good stir-fry and until now I've been pretty much sticking to this beef and broccoli recipe from Sophie Gray's More stunning food from small change. To have gained a whole retinue of stir-fry recipes is going to make for some exciting additions to my weekly menu plan. I discovered a new cooking ingredient, Kekap Manis (AKA sweet soy sauce), which Sophie has included in several of her recipes. I've already begun experimenting with this further in my cooking. A couple of the recipes I would change to better suit our tastebuds. There aren't enough photos for me - only around one every couple of spreads, where I would prefer one on every spread - or even better, one for every recipe. I'm ten times more likely to try a recipe if there's a photo of it because pictures appeal to my appetite and give me an idea of what I'm trying to create. However, they do increase the cost of producing a cookbook so perhaps Sophie was going for a happy middle ground to keep the price down for buyers. Visually it doesn't jump out at me. The front cover colour is a little dull so if I was browsing cookbooks at the store, I don't know if I'd immediately pick this one up. Overall, however, it's another great cookbook from the master of frugal cooking. It would be a great gift for someone going flatting or anyone trying to feed their family nice food on a limited budget (like me). I'll definitely be referring to it again and again. If you want to purchase a copy of 100+ Tasty $10 Meals, check out the Destitute Gourmet website where it costs NZ$29.95, or pop into any good bookstore. (Destitute Gourmet cookbooks are not available through The Warehouse.) If you buy it before 30/6/2010, you can go in the draw to win a $500 grocery voucher. Disclosure: Random House provided me with a copy of 100+ Tasty $10 Meals for review purposes. I was not compensated in any other way. All thoughts and opinions expressed are my own. mmm i was just in whitcoulls browsing the cookbook shelves and I definitely don't remember this one! I love sophie gray, I met her once and always remember one of her tips... to make sure you have a stock of canned tomatoes cos they can always liven up a meal and only cost $1.